The comments came just hours after McCain gave a speech calling on the U.S. to reassume its role as global leader and reject the “half-baked, spurious nationalism” currently gripping Washington. McCain said the comment was not directed at the White House but at the mood in Washington generally – a mood in the ’30s that he said led the nation into war. McCain declined to respond to the president’s comments when asked by Cronkite News reporters Tuesday, but Sen. Lindsey Graham, R-South Carolina, said Trump needs the Arizona senator to help advance the GOP agenda. “Hopefully they will work it out,” Graham told CNN. Graham also said that McCain’s speech as targeting a larger audience. 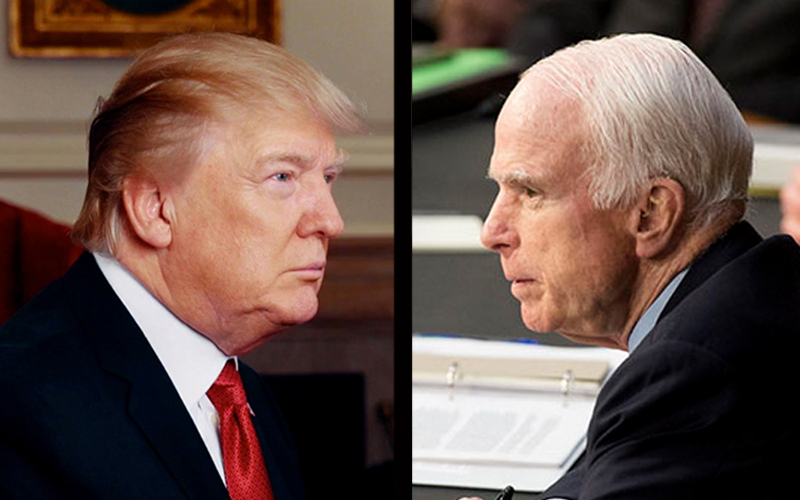 McCain and Trump have been feuding since the campaign, when then-candidate Trump belittled the war experience of McCain, a prisoner of war held by the Vietnamese, saying he preferred heroes who were not captured. It continued through this summer and McCain’s votes against GOP health care reform bills. The “nationalism” line that appeared to irritate Trump was part of a much larger speech that McCain gave Monday night at the National Constitution Center in Philadelphia, where he was given the 2017 Liberty Medal. The speech expanded on the call McCain has been making since he was diagnosed with a life-threatening brain cancer this summer, a call for more cooperation in Washington. Monday’s speech did not mention Trump by name and McCain said later Tuesday to CNN that it was aimed at the general attitude that currently pervades Washington. “There’s an environment here of non-productivity, of a reversion to the attitude of the ’30s, which was one of the major reasons why we fought World War II,” McCain said. Former Vice President Joe Biden, who presented the Liberty Medal to McCain, said that Monday’s speech was not surprising to people who know McCain, who Biden said often reminded fellow senators that their first responsibility is to the nation.